It is generally said that there are no genuine “Sri Lankan” Brahmins in the island today, and that those Brahmins who officiate as priests in Hindu kovils (temples) are of Indian origin with close ties with Tamil Nadu. Dr. Gananath Obeysekere, a Princeton University social anthropologist, says in his 2015 article: ‘The Coming of Brahmin Migrants: The Śudra Fate of an Indian Elite in Sri Lanka,’ Sri Lankans assume that due to the contemporary absence of Brahmins in the country, there were no Brahmins at all in Sri Lanka, particularly among the Sinhalese. He admits that in Sinhalese-majority South Sri Lanka, there is no record of Brahmins from the 19th century onwards. “But there is strong historical evidence that Brahmin purohitas were present in most, if not all the Sinhalese Buddhist kingdoms of Sri Lanka. Palm leaf manuscripts collected over the last 10 years and written from the 16th century onwards by village intellectuals, not only refer to the mass immigration of South Indian people but also deal with Brahmin movements into Sri Lanka, and list some of the villages they were settled in,” Obeysekere says. “Several manuscripts contain the term Brahmin or bamunu and hence village names such as Bamunugama and Kiribamuna. Texts from an important shrine for Lord Skanda in the Uva District mention its founding by two Brahmin brothers and their descendants who have non-Brahmin names,” he points out. “Dutch sources mention the existence of Brahmins in the city of Kandy during the reign of King Vimaladharmasuriya (1591–1604). The question then is: where have all the Brahmins gone?” wonders Obeysekere. Two palm leaf manuscripts from the mid-17th and 18th centuries pertaining to important Govigama (farmer) families in Matale District in Central Sri Lanka, have the name ‘Brahmana’ attached to their names. “The article suggests that given the numerical and political importance of the Govigama caste, various migrant groups, be they merchants or Brahmins, were assimilated into that caste with the more prominent Brahmins often placed in its aristocratic segment (Radala),” Obeysekere theorises. At any rate, Brahmin migrants from India had lost their caste upon crossing the sea. In Sinhalese South Sri Lanka they were absorbed into the top most caste, Govigama, Obeysekere says. In south west Sri Lanka, the Salagamas, traditionally associated with cinnamon cultivation and peeling, claim a Brahmin origin – a Namboodiri Brahmin origin to be precise. They claim that they are a “Brahakmana Wanshaya” which came from Saliya Mangalam or Saliya Pattanam in Kerala. It is said that a Sinhala King Wathhimi Buvenekabahu had a problem of being crowned King by Sri Lankan Buddhist monks because he was not a pure Sinhalese but was a son of a Muslim lady Fathima who was in his father’s harem. Thus, the King had to obtain the services of a Muslim nobleman «Periya Mudali Marikkar» from Beruwala to bring down «high caste» Brahmins from India to conduct the coronation ceremony. This was carried out by Marrikkar. The other theory is that King Bhuvenakabahu IV had a son by one of his consorts who was a Muslim, the King gave this prince the responsibility of looking after the King’s treasury and was named Wasthu Swami (Wasthu – assets or treasure) or later known as Prince Waththu hami or Wathhimi. Prince Wathhimi with the intention of becoming the King was searching for a Sinhala princess, but all the Sinhala noblemen with daughters fled Kurunegala. However, Prince Wathhimi managed to find a Sinhala Princess but the Brahmins in Sri Lanka refused to perform the coronation. The Prince sent a nobleman called Uduma Lebbe Marikkar to India to bring over Brahmins. Uduma Lebbe Marikkar along with Pathimeera Lebbe brought seven or eight Brahmins. Salagamas believe that their ancestors were Kerala Nambudiri Brahmins who migrated to Sri Lanka. Thus the Salagamas have family names which commence with Nambudiri (e.g. Nambudiri Senanayake is a Salagama caste family name) Namediri or Nanediri [the Sinhala version of Namboodiri, in which Nam or Nan means ‹Name› in the Sinhala language]. They have family names ending with the suffix Muni (Sage), e.g. Edirimuni, Demuni or Deymuni, Nammuni, Wettemuni, Walimuni or Walaimuni, Jagamuni, Yagamuni (Sage who performs yaga), Rammuni (Sage of lord Ram)] and family names such as Wijerama (the conquering Rama), and Weerakkodi. The Sinhalese Kings gave the migrants responsibility of managing cinnamon plantations, situated in the western and southern part of the island. The Portuguese and Dutch continued the tradition of using Salagamas as cinnamon planters, who had to provide cinnamon as a tax. During this era, many Salagamas adopted Portuguese names as their surnames, such as de Silva (or Silva, Zylva), de Zoysa, Abrew, Thabrew, Mendis and so on. In 1799, Ambagahapitiye Gnanavimala Thera, a monk from the Salagama caste from Balapitiya on the south western coast of Sri Lanka, departed for Burma with a group of novices to seek higher ordination. The first bhikkhu was ordained in Burma in 1800 by the Sangharaja of Burma at Amarapura. The initial mission returned to Sri Lanka in 1803. Soon after, they held an Upasampada ceremony on a Vesak Full Moon Day. The new fraternity came to be known as the Amarapura Nikaya and was soon granted recognition by the British Government. The Amarapura Nikaya was of pivotal importance in the revival of Buddhism in Sri Lanka in the 19th century. The Salagamas, who became overwhelmingly Buddhist, were in the vanguard of this movement. In 1658, the Dutch replaced the Portuguese as the European military, political and economic power; and Calvinism or Protestantism, displaced Roman Catholicism as the religion of the Christians in the island. Catholicism, which was a force to reckon with during the 150 years of Catholic Portuguese rule, almost completely disappeared. The Protestant Dutch, who saw the Catholics as a Portuguese political fifth column, persecuted them in such a way that practicing Catholicism was impossible. The condition of the Catholic community in Sri Lanka caused concern in Catholic circles Goa, India, which was the seat of Portuguese and Catholic power in India and the Far East. While Portuguese priests could be easily detected by the Dutch, Indian priests could infiltrate Ceylon unnoticed. But according to Fr. S.G. Perera, Indian missionaries could not be sent to Ceylon because missionary work outside India was the monopoly of the Whites. However, there was one person who was determined to go to Ceylon, no matter what the danger. He was Fr. Joseph Vaz, a young priest belonging to a family of Konkanastha Brahmin converts of Sancoale in Goa. 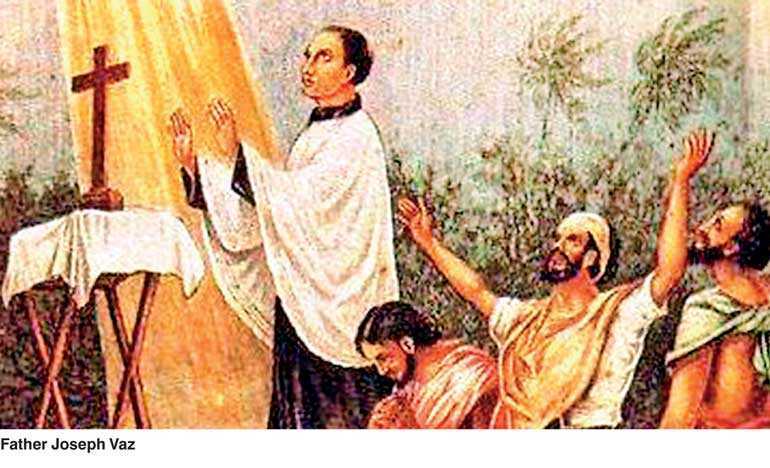 Joseph Vaz was prepared to go on his own, without the aid or backing of any of the established religious orders. Though of high caste and well-versed in Konkani, Portuguese, Latin, and later in Tamil and Sinhala, Fr. Joseph Vaz led a life of poverty, giving and ministering to the poorest of the poor. In Ceylon, he represented no power, no institution. But at the end of his 24-year near solo mission in the island (he never left it) he had created 70,000 practicing Ceylonese Catholics, from Jaffna to Colombo and from Kandy to Trincomalee and Batticaloa. He decided to go to Ceylon in disguise as a coolie (unskilled labourer) seeking work in Ceylon. Discarding his robe and shoes, he went about barefoot with only a cloth around his waist. He learnt to live on a diet of conjee (rice gruel) and rice, with little else to go with it. Out of necessity, as well as to avoid detection by the Dutch in Jaffna, Fr. Joseph Vaz went about disguised as a beggar. Begging allowed him to study Jaffna society at close quarters besides letting him lead the life that Christ would have liked him to lead, a life of poverty. Going by the account of Fr. S.G. Perera, the fact that Fr. Joseph Vaz was a Brahmin was a major factor inducing acceptance in Jaffna, because in Jaffna, more than in any other part of Ceylon, the Brahmin was held in the «utmost veneration». He was treated as a “sanyasi” (ascetic) in Jaffma and as Maha Swami in south Sri Lanka. As a result of his labours, Vaz is known as the Apostle of Ceylon. On 21 January 1995, he was beatified by Pope John Paul II in Colombo. He was canonised on 14 January 2015 by Pope Francis in an open-air mass ceremony in Colombo.